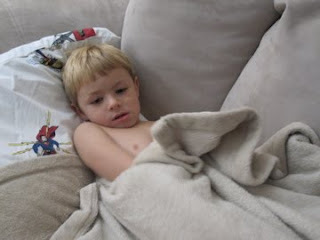 Exactly 2 weeks after the first day of school, Carson has gotten his first cold of the year. He woke up, crawled into my bed, and said, "Mom, I'm sick, I can't go to school". Poor guy! Sore throat, sneezes, and snot. He stayed home and rested on the couch most the day watching superhero movies.